Eligible students registered with ODS may request interpreting or C-Print services for their classes and other academic activities, at no cost to the student. Students must submit all requests via the AIM portal. Please allow at least 24 hours' notice for any requests. 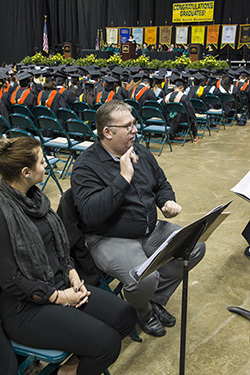 Wright State community members who are interested in contracting interpreters or C-Print for university events should contact Shonda Jones in ODS for instructions to arrange the services. Departments/organizations hosting the event and requesting the services are responsible for the cost of interpreting/C-Print services.